Description: basal registers, lower temple of the jaguar, great ballcourt. 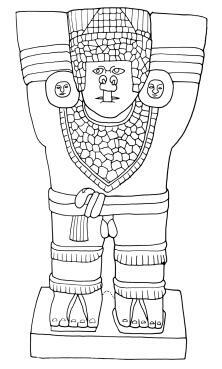 top = south wall with image of a mountain; middle = west wall with long-snouted head; bottom = center of west wall with maize god emerging from a mountain. Notes: inked by mark van stone. See Also: Schele Photos for ""
Description: wooden lintel from inner doorway, upper temple of the jaguar, great ballcourt. 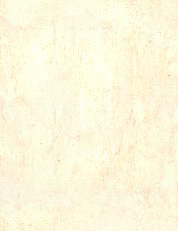 all three of the carved surfaces are shown. 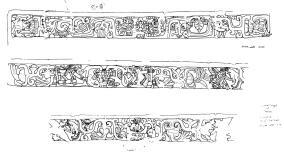 Description: carved panels, south and west walls, lower temple of the jaguar, great ballcourt. 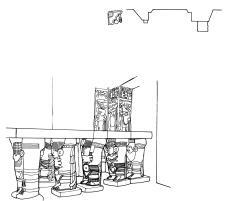 Description: south bench, inner chamber, temple of the chac mool showing six of the 14 figures, each sitting on a jaguar-pelt covered seat. 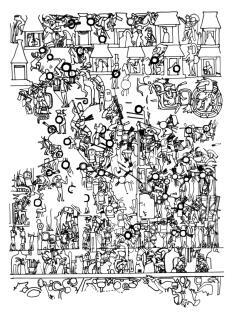 Description: north panel from painted mural, upper temple of the jaguar, great ballcourt. 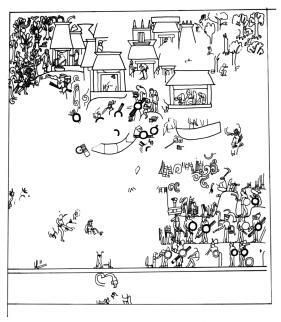 shown is a battle among a town of thatched-roof buildings. Description: northwest panel of painted mural, upper temple of the jaguar, great ballcourt. shown is a battle at a walled town. 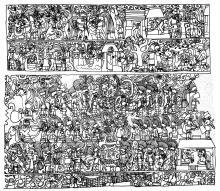 Description: lower register of south panel from painted mural, upper temple of the jaguar, great ballcourt. 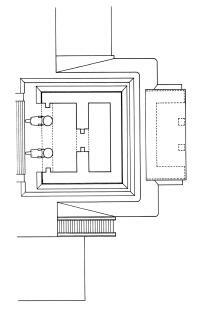 Description: rollout drawing of west column in doorway, north temple, great ballcourt. 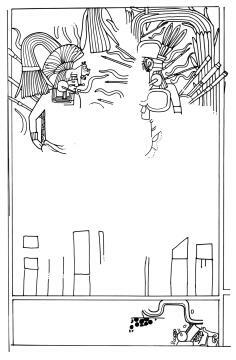 Description: southeast panel of painted mural, upper temple of the jaguar, great ballcourt. shown is a prelude to battle. 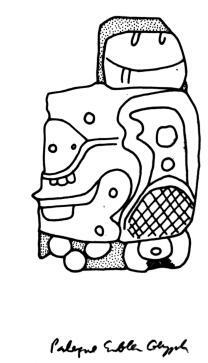 Description: stucco glyph fragment of palenque eg. Description: profile of great ballcourt (above). below is atlantean "altar" (also identified as a table or bench) in front of inner doorway, upper temple of the jaguar, great ballcourt. Description: north wall l, north temple, great ballcourt. 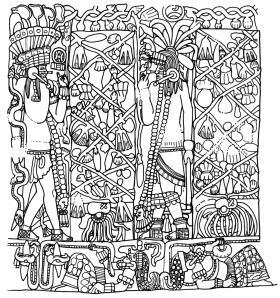 shown is the accession of the itza ruler framed by the activities of the ballgame and the office of ruler. 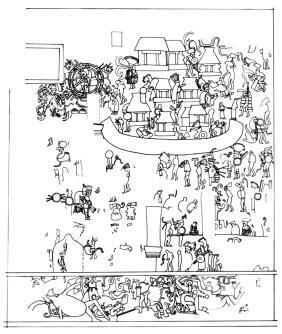 Notes: the east and west walls of the north temple mural, and illustrated in maya cosmos and code of kings, were drawn by linnea wren and do not appear in this collection. Description: center panel from painted mural, east wall, upper temple of the jaguar, great ballcourt. 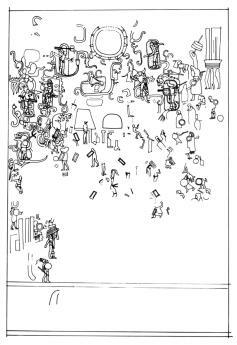 Description: plan of upper temple of the jaguar, great ballcourt. Description: leg #1, atlantean altar, upper temple of the jaguar, great ballcourt.